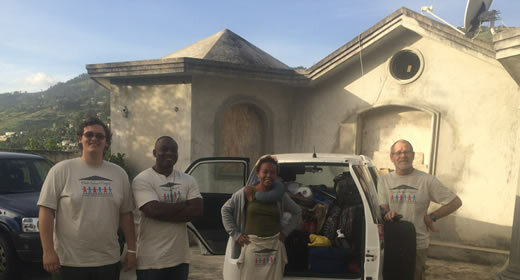 Robert Dickinson (BA ’17) is submitting this field report from his summer 2016 internship at Haiti School Project in Port au Prince. Travelling always feels the same to me: the harsh recycled air on my flights; the long walkways and loudspeakers of the airports; walking through customs, security, and wherever I need to go with my earphones in and my hands gripping the handles of my purple luggage. So it was my first footstep outside of Toussaint Louverture International Airport that my internship really sank in. Review more internship field reports from Ford School students serving organizations around the world. I was instantly surrounded by taxi-men and baggage carriers looking to both help me out and make a few quick bucks off the Blan (a Haitian slur used towards [predominantly white] foreigners). It was a brand new experience, but something I would get used to over the course of my internship there: one of the many cultural adjustments I made. I was now 2000 miles from Ann Arbor, working with the Haiti School Project (HSP) as their first intern. HSP promotes a sustained investment in education with the goal of fostering economic development and improving the quality of life in Haiti. Formed six years ago when listeners of an NPR program came together to organize, fundraise, and construct a school in Villard, Haiti, Haiti School Project had succeeded in its first objective. This summer I worked on fundraising and organizing the group’s many files, but most importantly on working to help HSP leaders choose a direction. HSP was at a vital point for any nonprofit; it had completed its original objective and needed to choose a direction for the future. The Board of Directors wanted an outsider to look at options and work with them as they chose the best course. It was an honor to be of service during such a special time in the organization’s history. Haiti is a gorgeous country, full of fog-wreathed mountains, delicious cuisine, beautiful beaches, and friendly people. Formed after a successful slave rebellion against the French, it has a history of standing up for its independence and freedom. But it is also well-known as the poorest country in the western hemisphere. My time there brought me to many rural villages, urban slums, bustling markets, and an exclusive beach resort reserved for the wealthy. The horrific inequality was obvious, but so too was the incredible hope Haitians have for the future. The people I met value education immensely, and give almost everything they have to allow their children to attend school in the hopes of bringing them a better life. Unfortunately, schools in Haiti can be expensive (there is little public schooling) and under-performing. In addition, the Haiti earthquake in 2010 destroyed many schools in and around Port au Prince. So investment in education is vital for the development of Haiti, and HSP takes pride in being a part of that movement. Currently, Haiti School Project has four main projects: finishing up a school in Terre Froide, Haiti with one of its partner organizations, Haiti: Hands On; getting ready for a big fundraising campaign in the fall; distributing solar lights as part of its Shed-A-Light project; and expanding a website that was designed to promote collaboration between all the small groups working in Haiti, The Haiti Collaborative. My learning through the Ford School has given me great insight on macro level development, and taught me about the ways in which policy can have massive effects on a country’s growth. In this internship, I wanted to experience international development on a micro level; I wanted on-the-ground experience. This internship helped me gain experience in working overseas, collaborating across cultures, preparing memos for organization leaders, and web design. This combination of skills will stay with me as I work in international economic development: my plan once I finish school. Robert Dickinson (BA '17) is from Grand Rapids, Michigan. He is passionate about the global fight to end poverty and is involved with the ONE Campaign, United Students Against Sweatshops, and the Student Union of Michigan.